Wretha Thomas is a former bus driver and president of the union. She says she has seen the video from on board the HISD bus that careened off the South Loop. HOUSTON (KTRK) -- In the wake of the deadly school bus accident that claimed the lives of two young girl, HISD is mourning their loss and reviewing their bus procedures. With about 1,000 buses on the roads every day, HISD says it has been more than 15 years since a student has been killed in a crash. "The driver did everything she could," Thomas said. "She did everything she had been trained for to protect the kids' lives." The driver was near the end of her route when the bus crashed. According to HISD, Louisa Pacheco was on her way to Furr High School with the four students on board. District records show Pacheco has been driving for HISD for three years and has a clean driving record. In addition to training for her CDL license she's gone through an annual back to school program HISD that says is about 10 hours. General Manager of Transportation Nathan Graf says it includes a scenario similar to this fatal crash. "Where the bus actually flipped and drivers are prepared as far as what kind of care to provide and preventative driving as well," Graf explained. The bus was purchased in 2008 and had its last inspection in the summer. It was equipped with seven video cameras, lap belts and other safety features that will be examined during the investigation. Graf said, "On the interior of the buses, it's similar to an egg carton where you have high seats, they are very tight together with thick padding." Back at the bus barn, watching one of their mangled buses being towed in is a very tough day for those who have been behind the wheel of one. Thomas said, "The drivers don't drive the bus because they get paid a lot of money, the driver drives because they love these kids." 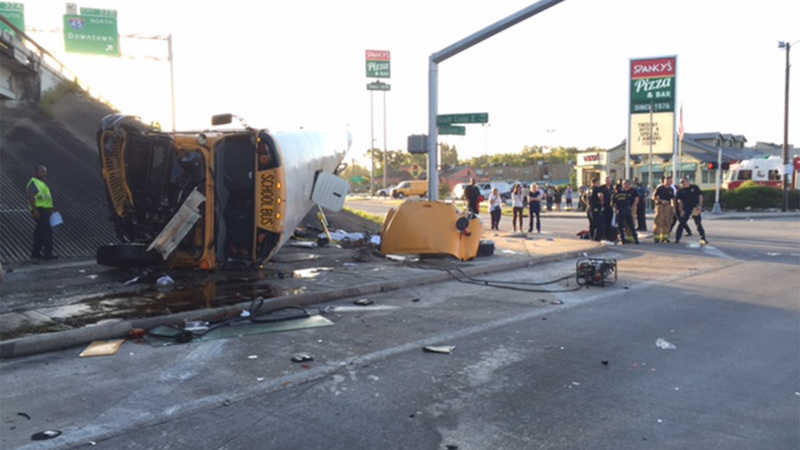 Two students were killed and two others seriously injured when a school bus careened off the 610 South Loop at Telephone Road.